Stuffed zucchini, filled with sausage, tomatoes, onions, mushrooms and Parmesan cheese, then baked to perfection!! Cut zucchini in half lengthwise. Using melon-baller or small spoon, scoop out zucchini flesh, leaving shells about 1/4-inch thick. Reserve half of the flesh; chop coarsely. Set both flesh and shells aside. Heat 2 tablespoons of olive oil in a skillet over medium-high heat. Sauté onion and garlic until soft. Add mushrooms and reserved zucchini flesh, sauté another 2 minutes. Remove from heat. In a separate skillet heat the remaining tablespoon of the olive oil over medium-high heat. Crumble in sausage, cook until lightly browned on all sides, stirring occasionally, about 6 minutes. Stir in cooked onion and mushroom mixture. Add the wine. Stir in tomato, basil and rosemary, cook 1 minute longer. Drain any excess fat. Remove mixture from heat, set it aside to cool. Preheat the oven to 375 degrees. When mixture has cooled, add cheese, egg, salt and pepper. 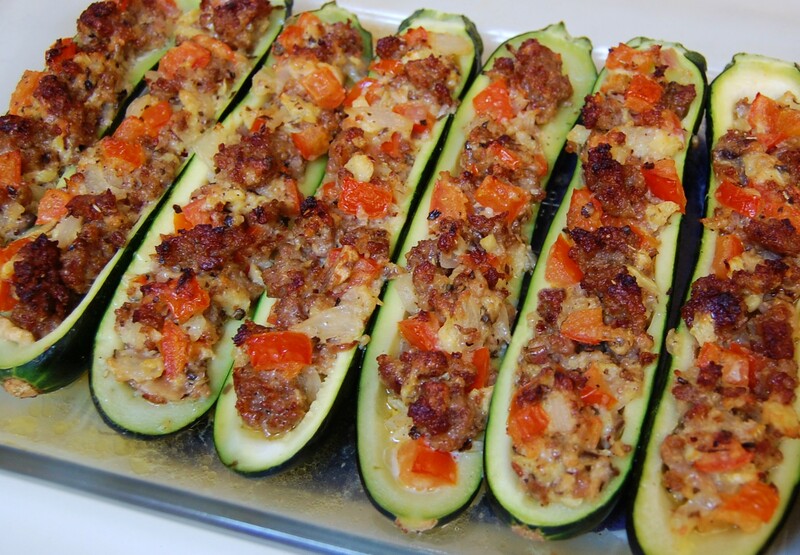 Fill zucchini shells with sausage mixture. Fill a 9x13-inch baking dish with 1/4 cup of water. Place the filled zucchini shells in the pan and bake for 40 minutes, until golden brown. 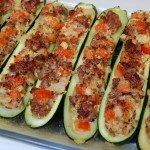 Remove the zucchini boats from the pan and serve immediately. Cook's Note: Before scooping and stuffing, cook each zucchini half in the microwave for a 15 seconds, this makes it easier to scoop out the flesh. Very tasty! Would like to download to use again or even email to myself – not seeing the way to do that from here!